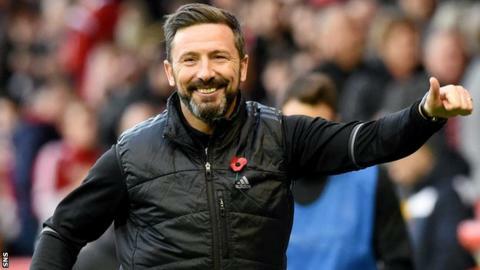 Former Rangers midfielder Alex Rae expects Aberdeen's Derek McInnes to move to Ibrox if he is offered the manager's job. McInnes is the Ibrox club's preferred candidate to succeed Pedro Caixinha. Asked if McInnes would take the job, Rae said: "I look at the dynamics up at Aberdeen and he's been to a couple of cup finals last year and he's won the League Cup a couple of years ago. "And I think, okay, that's as far as he can go." Aberdeen have become Celtic's main challengers in recent seasons and were runners-up to the Glasgow side in all three main domestic competitions last season. They again sit second behind the reigning champions in the Scottish Premiership. But Rae thinks that Rangers' greater spending power would be an attraction to former Ibrox midfielder McInnes. "We talk about a challenge, the finances he would have at his disposal, would be substantially more," he told BBC Scotland. "He knows the expectations, so when he comes on board, he knows that a draw's not good enough away to one of the provincial clubs. "He knows the demands of the fans and I think this is one of the things that actually goes in his favour." Former Celtic midfielder Peter Grant, who worked as a coach under Alan Pardew at Reading and West Ham United, believes the Englishman would be interested in the Rangers job. Rae thought the former Newcastle United boss, sacked by Crystal Palace in December, could also be a good choice and said: "Alan Pardew's CV is fantastic. "I know Alan very well - I played against him when he was at Charlton for five years as a player and then I watched him develop into a manager. "He had a very good Southampton team and some top players. "The CV's very much there. It's really whether he would like to come up under the circumstances."